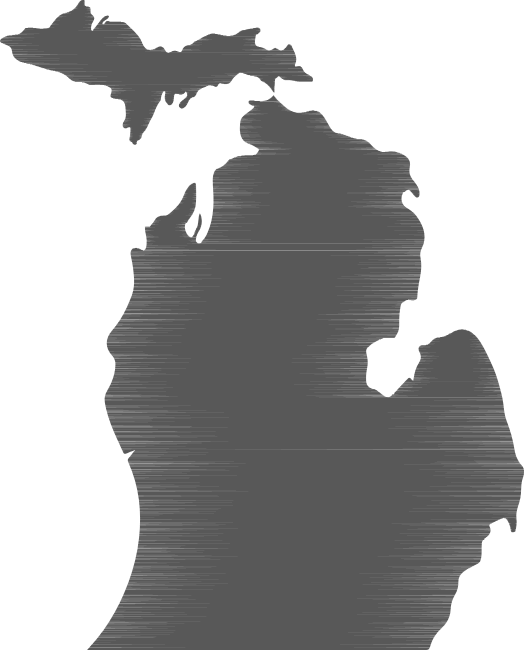 I am a web, graphic and editorial designer living in Michigan, and enjoy creating clean, beautiful websites and designs. Whether I’m working in an Adobe program or coding HTML5, CSS3 or jQuery the entire design process is always exciting. In my spare time, I enjoy playing video games, watching movies, reading a variety of books, dabbling in the craft of needle felting, browsing the Internet of course, and sometimes playing the flute or piano. Create a complete visual identity for a technology startup from beginning to end. The project requirements were to come up with the company’s name and to design a logo, business card, letterhead and responsive web design mockups for desktop, tablet and mobile views. The “Apposite” font is called D3 Circuitism. The straight lines make me think of the back-end development of applications which is all very technical, and the smooth curves to the font resemble the front-end development, where everything is made to look pleasing to the eye. For “Technologies” I used Archivo Narrow. It is a very clean sans serif font and, when paired with the D3 Circuitism font, helps to balance the whole logo. The brand fonts I chose to use are the Archivo Narrow sans serif font, and Gaspar, which is a serif font. I felt Archivo Narrow could be used on all digital materials, as it would read well on a website, phone or tablet. I chose Gaspar for use on print materials only. This font paired well with the logo and the brand colors. It has a clean, modern and technical feel to it, which works very well for this company. The teal and blue-gray make everything look very clean and technical, yet modern and cutting edge. The colors really pop when placed together. 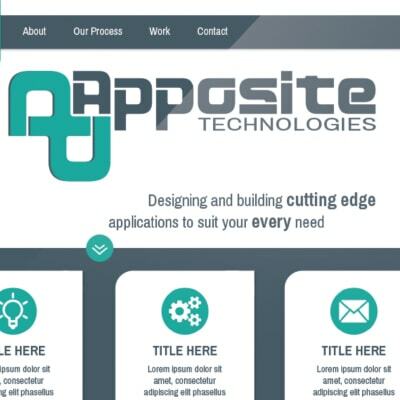 On the desktop and tablet versions, I wanted the “Apposite Technologies” logo to stand out on the home page because it not only lets the user know what the company is, but it is a very visually interesting image as well, and adds to the overall design of the page. I then placed four boxes, with rounded and straight corners to mimic the logo, with a symbol in each that could potentially give a little information about their services, process, or anything they may want to include here. In the mobile version, I dropped the image of the phone with the pictures of the applications so I could make the “Apposite Technologies” logo stand out at the top. The menu is placed in a collapsible-style box at the top right of the page. I kept the same rounded and straight corners for this small menu box to keep the design consistent. I collapsed the four boxes into bars which could be tapped to expand to read the information that corresponds to each of these symbols/titles. 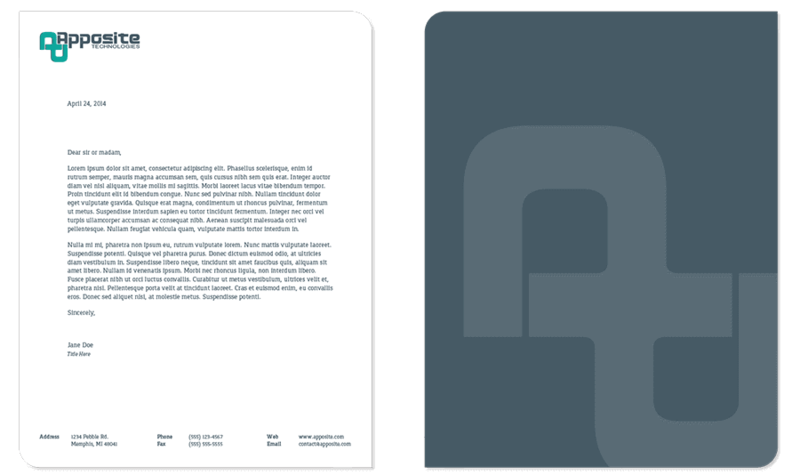 I wanted to go very minimal on the letterhead so as to give a clean, technical and modern feel. I used the same rounded and straight-edge corners and placed all the contact information in a clean arrangement at the bottom. The logo is placed at the top left as it is the first thing seen when viewing the letterhead. Because I went very minimal and clean on the front of the letterhead, I decided to give some visual interest to the back of the page by making it the blue-gray color and placing a large watermark of the logo symbol, creating a very cutting edge, modern look. I went with two different styles for the business card. Both options utilize the rounded and straight corners, mimicking the logo. 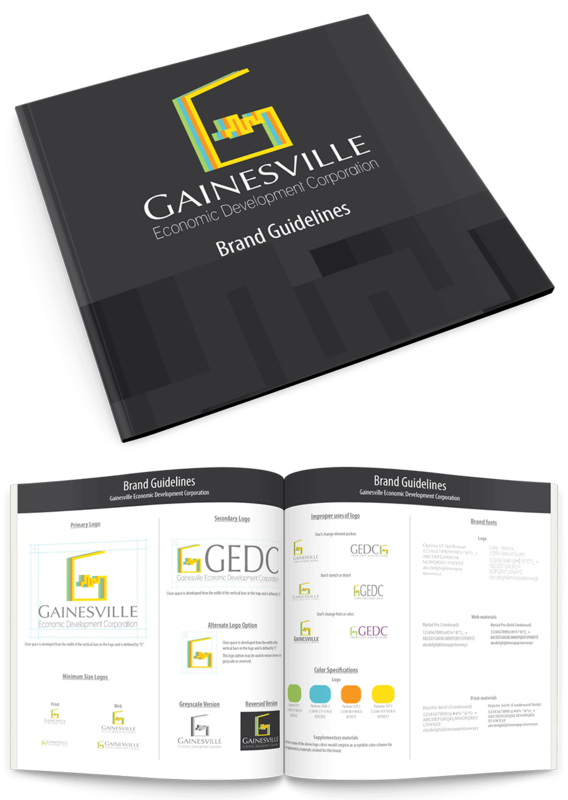 Create a new brand identity for Gainesville Economic Development Corporation, including a new logo and branding guide from a provided creative brief. The brief stated the organization wanted a new identity that was fresh and exciting in order to attract new businesses to the area. They wanted a logo that represented growth and development and that also had a professional look and feel. The new brand identity was to be used on materials for print and web and needed to be flexible enough to fit on both small- and large-scale items. I wanted people to look at the logo and think of Gainesville, which is why I used the “G” as a starting point for the design. I then made the “G” point upwards at an angle at the top, representing growth, while the lines in the middle of the “G” move up and down representing buildings and development. The four colorful lines building on top of one another also help in the overall representation of growth and development. I chose the four colors not only because they were fresh and exciting, but because they are reminiscent of bright, sunny Florida. When layered on top of one another, these colors work well in showing some depth in the logo, and give it a fun, yet professional, look and feel overall. I used Optima LT Std Roman for the word “Gainesville” because it has a very refined, yet bold and professional look. It complements the sleek lines in the “G” symbol while also grabbing one’s attention with its attractive, clean aesthetic. 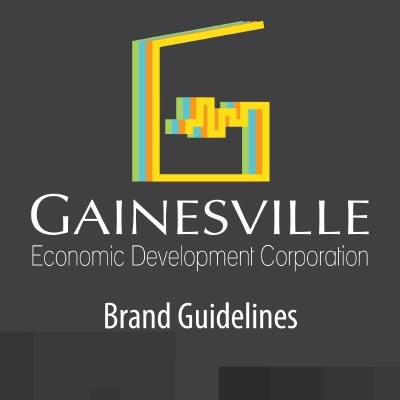 I chose Lane-Narrow for “Economic Development Corporation.” It has very simple lines and complements the bolder, angular lines in “Gainesville” so everything goes together nicely without looking overdone. For this project, the Brand Guidelines didn’t need to be anything intricate or overly detailed. I included information on clear space for the primary and secondary logo styles, minimum size logo variations, alternate logo options, color specifications, brand fonts and improper uses of the logo. For the cover, I chose to use the dark gray from the text in the logo for the background. I also enlarged the center of the “G” from the logo and enlarged and overlaid the image on the background for visual interest. This project was for the capstone course in my master’s degree program. Working as part of a team, we were to develop a comprehensive communication campaign based on research and client needs. The completed campaign was to be presented to the client at the end of the course and the client was to determine an overall winning team that best captured their vision. The client was Caleb’s Pitch, a non-profit organization based in Gainesville, Florida that is dedicated to creating memorable experiences and enhancing the quality of life for children and families confronting serious childhood illnesses. We were chosen by the client as the overall winning team. Throughout the semester, we were tasked with creating a situation analysis, a logo redesign, creative brief, branding guide, wireframes and mockups for the new website proposal, a campaign strategy along with multiple design and identity pieces, the final working website, and a complete campaign book that includes everything stated above. While my teammates and I each had a say in every aspect of this project that we did individually and as a group, I will be focusing on the items I designed and laid out, as well as the logo and website, which we worked on together. Our team’s main goal was to add artistic elements to the Caleb’s Pitch logo. We felt the current logo is too focused on sports, and doesn’t highlight the organization’s main program, which is syringe art. The final design we chose incorporated different elements from some of each team member’s sketches and ideas. By incorporating Caleb’s silhouette, we hoped we could carry on his spirit and legacy. The silhouette was taken from an image of Caleb when he threw the first pitch at a Red Sox baseball game, the one the organization is named after. While this design incorporates his story and the organization’s past, it also incorporates a new element with paint. The paint streak helps add fun new colors which work well with a children’s organization, and are more diverse than the current red and blue colors. The symbols in this proposed logo would help add recognition, and can move forward with the organization as it grows. We chose a sleek font to remain contemporary and professional yet balanced with the fun colors and design. With the Brand Guidelines, I made sure the overall design of this guide fit with the design of other pieces we created for our project. I enlarged the paint streak from the logo and used this for visual appeal and continuity throughout the pages. The use of the orange color blocks on each page not only fit with other pieces that were designed in this project, but also served as a background for text information. The guide includes information about Caleb’s Pitch, what the “clear space” around the logo should be, how to use variations of the logo, whether it’s in full color, black and white, etc., what our proposed brand colors and fonts are for Caleb’s Pitch and how they should be used. There were a variety of design pieces we created in this project for Caleb’s Pitch. These pieces included tote bags, T-shirts, water bottles, custom syringe pens, name tags, a brochure, flyer, newspaper advertisements, letterhead, envelope, business card, thank you card, website banner ads, and designs for a Facebook cover and profile image. The pieces I was responsible for designing were the brochure, business card, envelope, letterhead and T-shirt. With each of these pieces, I wanted to make sure the design was consistent across all of them. I used the enlarged version of the paint streak from our new logo design on each of these pieces to once again draw visual interest and keep things consistent. 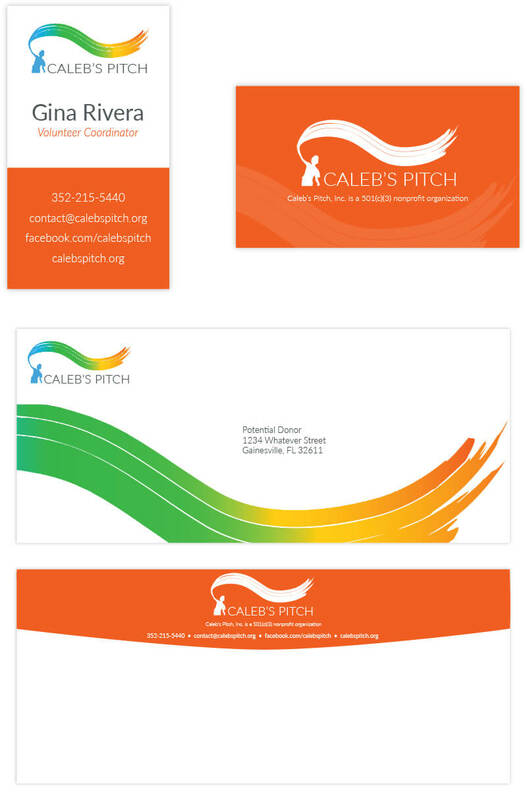 I also made sure to show multiple color options for the business card, envelope, letterhead and T-shirt designs using the proposed brand colors for Caleb’s Pitch: Blue, green, orange, yellow and gray in some cases. 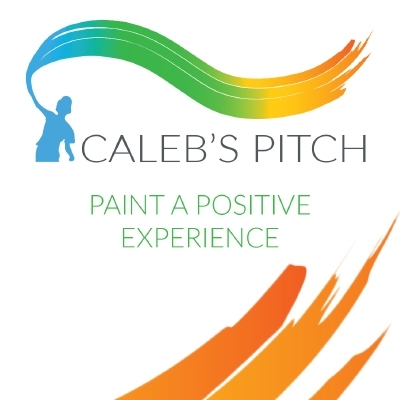 On the back of the T-shirts and cover of the brochure, I included a slogan which we all came up with for the organization which was, “Paint a positive experience.” This slogan reiterated simply what Caleb’s Pitch does and what they stand for: They offer positive experiences for children through painting. Since the Campaign Book was to include everything my team had created throughout the semester, I wanted to create a design and layout that would separate each piece for the various sections, but also make the entire book look very consistent with the new Caleb’s Pitch branding. I made use of the brand colors by using a different color for each new section in the book, and since there were more than four sections, I just rotated through the colors as needed. I also used color blocks on each page with varying transparency not only because they added visual appeal, but they also fit well with the color blocks we utilized on many of the other design pieces, including the website. The use of large photos on various pages, including those that separate each section, was very important as the client mentioned how much they wanted photos to be included on their website and other design pieces as it showed the special moments that children have with Caleb’s Pitch. 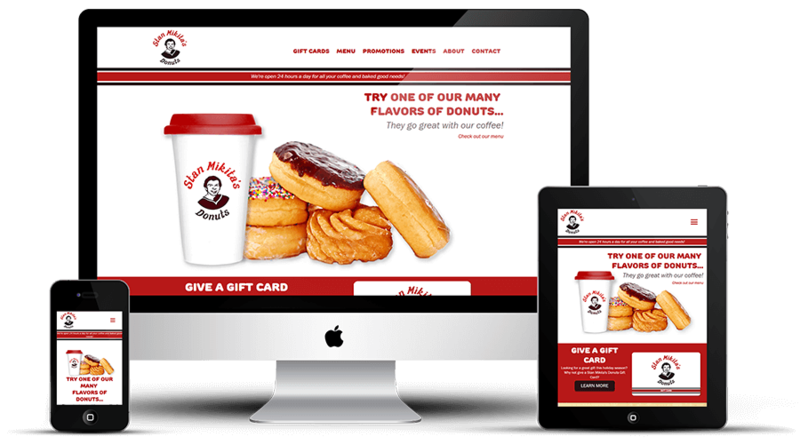 There were several things that the client expressed were very important to their organization and that they would like to have on a new website. When designing and creating this site, my team and I made sure to pay attention to these elements and make sure they were straight forward and easy to use and update. For simplicity of making updates, we chose to create a custom site using WordPress. Including myself, there were four of us on the team and we each had a hand in creating content and coding pages of this website. After everyone coded the pages and sections they were assigned, I brought all of our code together and made sure redundancies were deleted and that all the code was consistent and worked well to make one cohesive site. 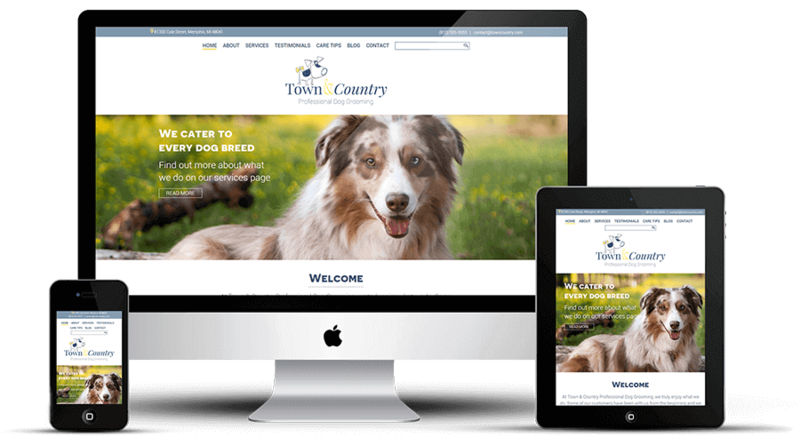 The client stated that they wanted a site that was not only something fun to look at for children, but also had a professional look and feel as well, for the potential donors and volunteers that would visit their site. For that reason, we chose to use the various color blocks throughout the website with large photos to add visual interest and give a fun, colorful vibe to the site. 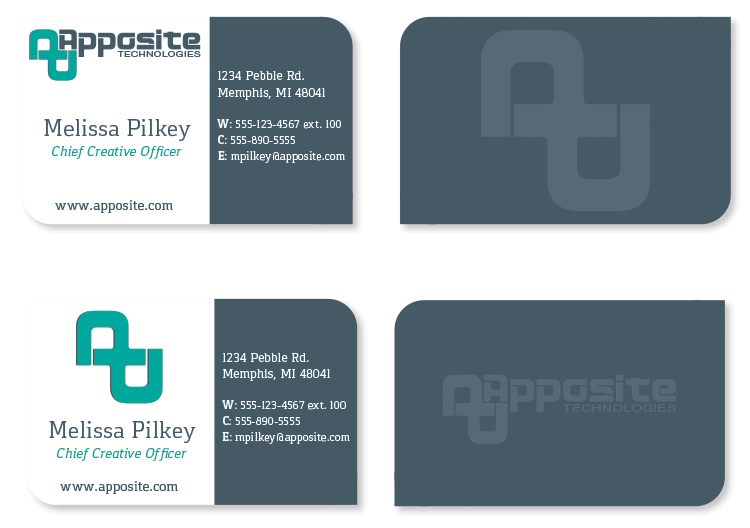 We then used the dark gray to add contrast to the bright colors and bring in a professional feel to the site as well. Since they rely heavily on volunteers and donations, we made sure that the Donate and Volunteer buttons stood out in the header of every page and that the Donate Now button on the Home page next to the photo of the little girl painting was very prominent. We added a Volunteer Spotlight section on the Home page to draw more attention to the great things that volunteers do for Caleb’s Pitch and the fun they have. This is something the client could update as often as they want with a fun quote from the volunteer along with their photo and could spur visitors to want to volunteer themselves. The About page tells about Caleb’s story: Who he is and how Caleb’s Pitch came to be. We also included a small section on what exactly syringe art is and an In The Media section so they can include links to articles and/or videos that the organization was included in. The Events page was something that they really wanted to have on their site. The plugin that was used here to showcase various events that Caleb’s Pitch has coming up, which was called The Events Calendar, offers many options for the client. They could include maps, or links to any page for people to sign up for an event, which was important to them. The Experiences in Photos section on this page was another element the client really wanted. They wanted visitors to be able to upload their own photos to the website of their experiences with Caleb’s Pitch, but didn’t want the photos to automatically be shown until someone at Caleb’s Pitch approved them. The plugin we used, which was called NextGEN Public Uploader, not only allows users to upload photos, but the client is given the option of whether or not to approve those photos to be shown on the website in the gallery, which was also achieved through a plugin called NextGEN Gallery. On the Contact page, we made sure to offer multiple ways one can get in touch with someone at Caleb’s Pitch. They could simply fill out the form for information on various things they select, or they could call, email, or visit their Facebook page. To create the form, we used the Contact Form 7 plugin. On the Donate and Volunteer page, we offered several different options for people to be able to donate. Since we didn’t have to make everything on this site fully functional, just give a general idea of how things would work, the Donate buttons on this page currently link back to the current Caleb’s Pitch website. However, these buttons would ideally link to a PayPal page with the amount selected already filled in. Or, if one were to choose Donate Other, once directed to the PayPal page, they could enter any amount they wish to donate. We also included a section on this page for a Most Valuable Donor. This section could be changed out by the client as often as they wish and offers a nice way to say thank you to someone, or some group, that donated to their organization. There are also a few paragraphs under the Volunteer Opportunities section which various people could relate to. If they are interested, they can click on the Contact Us button to go to the Contact page. 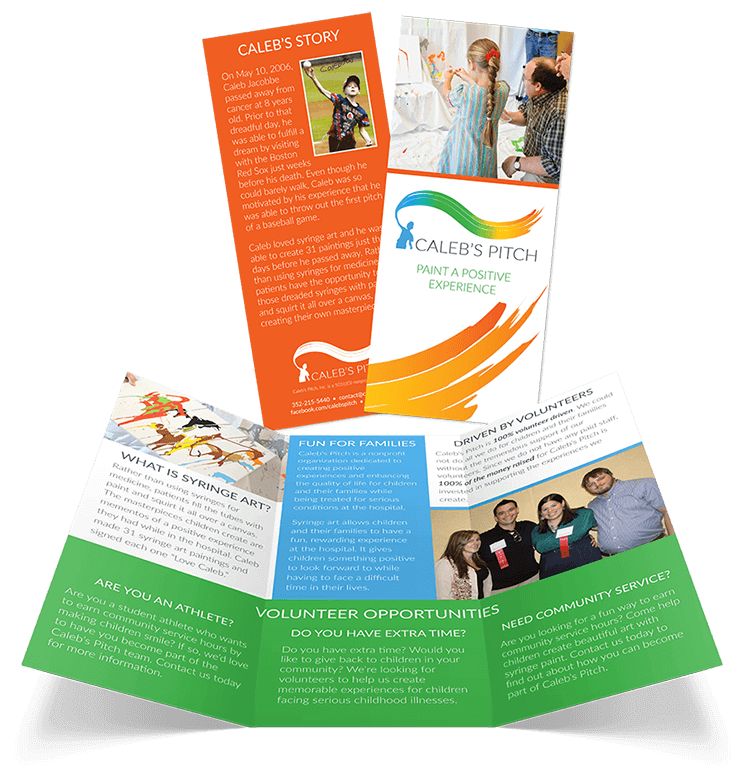 The section below this explains that Caleb’s Pitch relies heavily on volunteers and if one would like to learn more about what they do, they can click See More to be taken to the Events page to check out all the fun events the organization has going on. Two other plugins we utilized on this site were for the favicon and the mobile navigation menu. Those were called Favicon by RealFaviconGenerator and SlickNav Mobile Menu. 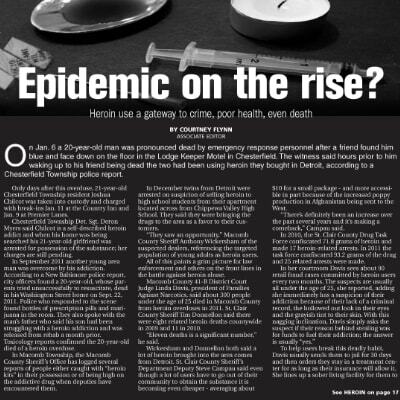 Create an engaging layout design for a cover newspaper story dealing with the rising use of heroin, and how it is a gateway to other dark paths. 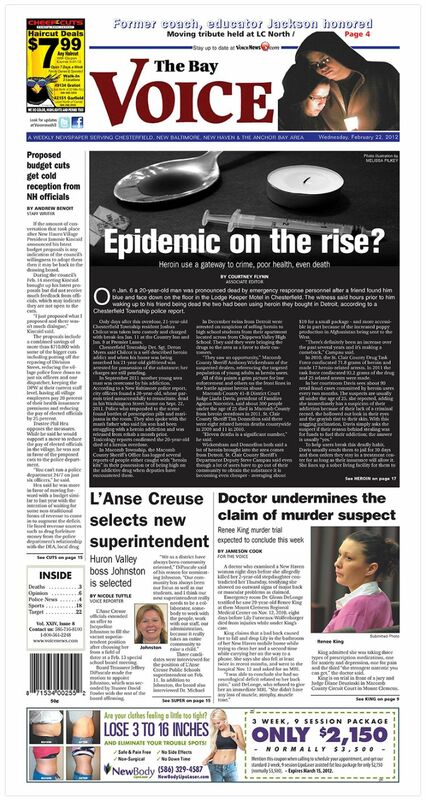 I used a dark composite photo of heroin and paraphernalia to draw one’s attention to the story and large white headline, “Epidemic on the rise?” I combined the darkness of the photo with a dark background for the text of the story that ran on the cover of the newspaper to make it really standout on the page. This also mimics the darkness that heroin can lead to in one’s life. I then placed the opening paragraph text across five columns and the rest of the text on the cover I placed in three large columns. This not only helped to add visual interest and appeal to the story but also with reading the white text on the dark background. This layout design was submitted to the Society of Professional Journalists Awards, Detroit and received second place in the Page One Publication Design category in 2013. 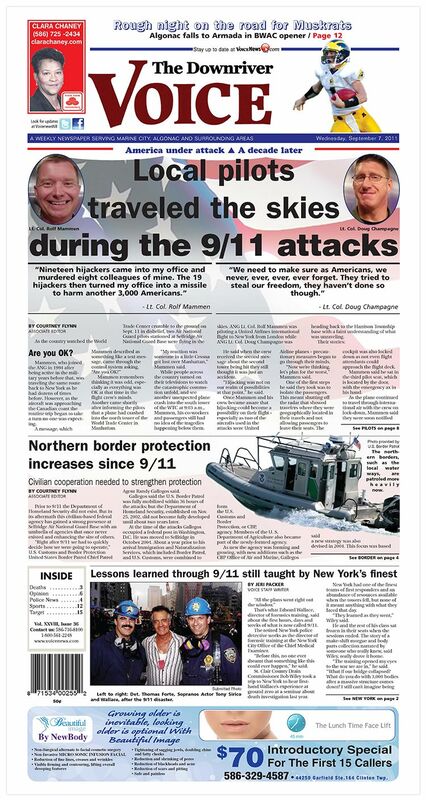 When this layout was created, it was to commemorate the 10-year anniversary of the 9/11 attacks. 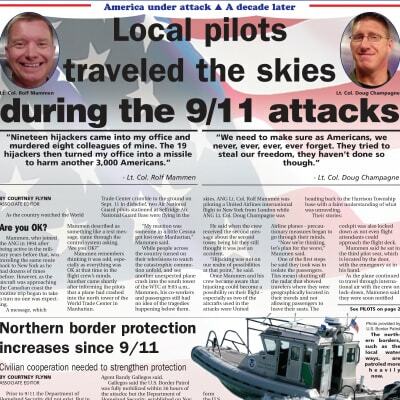 The objective was to create an attractive cover layout for a lead story, and a supplemental story as well, about two local pilots that were flying the skies during the attacks. I wanted the pilots’ faces to be the first thing to grab one’s attention on the cover, so I placed their pictures at the top on either side of the headline. The American flag is a very powerful symbol so I wanted to use that as the background to the stories, which I slightly faded down the page. This made for a very patriotic and bold cover for this edition which easily grabs attention. This layout design was submitted to the Society of Professional Journalists Awards, Detroit and received second place in the Page One Publication Design category in 2012. Create an attractive, attention-grabbing cover for a special tab section in the newspaper covering the local Armada Fair. Each year the Armada Fair brings in a headliner for a big concert, and in 2013 that was Kellie Pickler. I used one of the provided publication photos which was very elegant. I enlarged the photo to draw more attention to Kellie’s face so her eyes would draw one into the cover. In keeping with the soft nature of this cover, I went with a script font for “Armada Fair,” which also mimicked the sweeping curls in Kellie’s hair, and I used a nice golden brown for the text. I was to choose a product or company that I believe needed a new visual identity, and then redesign their logo. 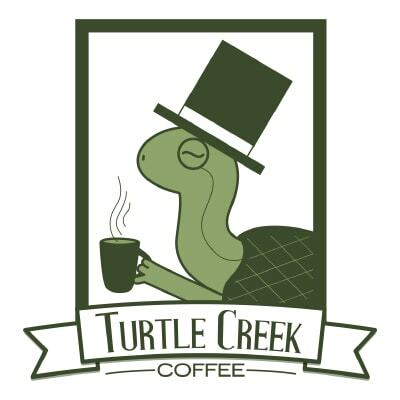 I chose is to redesign a logo for Turtle Creek Coffee, a business based out of South Carolina. They describe their coffee as being gourmet, “Artisan Micro-Roasted” where they take a hands-on approach to roasting all their coffee, as it is all done in their shop. They also state they take extra care to provide coffee beans that come from socially and environmentally responsible crops, and charge $13 to $15 per pound for the different varieties they offer. My inspiration for the first logo was drawn not only from the company name, as I used a turtle in the logo, but from the company’s statements about what they strive to provide the customer: A superior, gourmet, artisan coffee. This led me to create the “sophisticated turtle” as I call him. I wanted this logo to exude refinement and classiness that one would expect of a great gourmet coffee provider. The turtle looks very dapper in his top hat and monocle, while holding his cup of coffee and sticking out his pinky. The font I used for “Turtle Creek” is Antique Book Cover. This font is classy and gives a strong, sophisticated overall look. I used Lane – Narrow for the word “Coffee” as it helps add a smooth, elegant and modern feel to this logo. The ribbon really helps draw one’s eye down to the company name from the turtle above and ties everything together well. For the second logo, my inspiration came directly from the company’s name. It led me to the idea of creating a turtle with a coffee bean for a shell. The font I used for this logo is Lane – Narrow. It gives off a very clean, modern feel and adds a sophisticated look for the company which claims to have rather high-end coffee. I created the turtle with very simple, smooth lines to reflect this modern, sophisticated feel. In both logos I used the same green and brown colors. My reasoning for this was that they not only mimic the colors of a turtle, but also the colors of coffee. These natural tones also reflect the fact that the company is an environmentally responsible one. Create a responsive WordPress template for a semester-long blog project using PHP, CSS, and HTML, as well as the grid feature from Zurb’s Foundation. The goal of the project was to demonstrate that I understood how to produce content in a content management system and that I was also able to add functionality by using at least three WordPress plugins. Once the template was implemented, the project required that I create 16 posts of content centered on a topic related to the course: Web Interactivity and Engagement. After doing two separate wireframes and mockups, I ended up combining elements of the two for my final WordPress template for this blog. 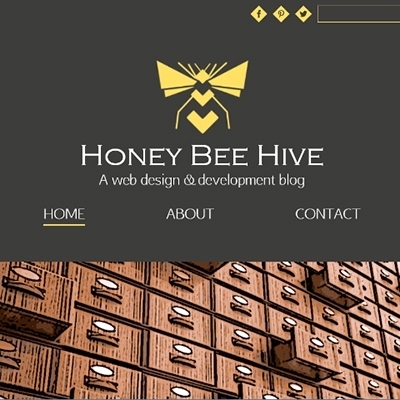 I called it the “Honey Bee Hive: A web design & development blog.” I named the blog in this way because my name, Melissa, means “honey bee” in Greek and a hive is defined as “a place swarming with activity,” which a blog tends to be. I knew I wanted to possibly use this blog in the future, in addition to my portfolio site, which is another reason I went with the honey bee theme. I wanted to keep things somewhat consistent. 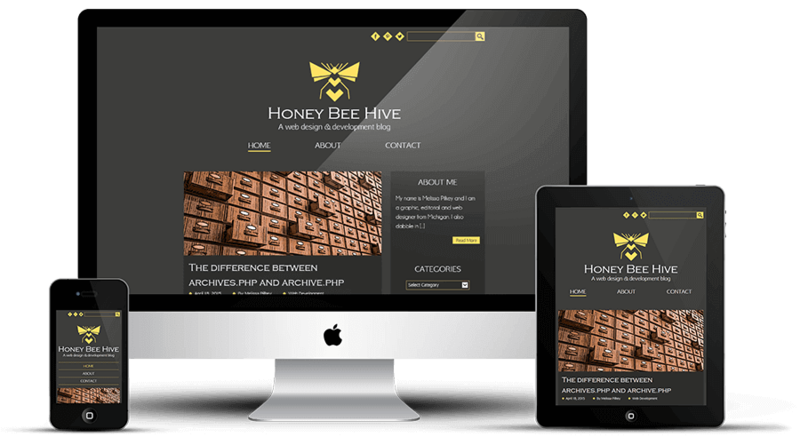 Although the Honey Bee Hive blog and my portfolio site have very different designs and feels to them, I think this is OK because of the content being presented on each. For the blog, the content is typically technical in nature, revolving around coding, web development, software, etc. so the dark grays and angular lines in the bee logo look more modern, while my portfolio site is more of a reflection of me as a person; I’m very down to earth and casual with an affinity toward stylish design that works great. For the images at the top of each blog, I didn’t want to use photographs. I wanted more of an artistic look to each image, so I used Photoshop to create a colorful graphic image for each blog post. The one exception to this was the image for the “Brackets: An open source text editor” blog post. For this one, I used a screenshot of the Brackets program with multiple lines of code. I felt this one worked well because the theme I have set for Brackets is a dark background with very colorful text, so it still looks like a modern, artistic graphic. As stated above, the content on this blog is more modern and technical in nature, so I wanted the logo to reflect that. After coming up with the name, I worked on the design of the bee. The typical roundness to a bee was too soft for this site, so I changed the circular areas to diamonds on the body, which mimics the other diamonds and angular lines I used throughout this site. I did the same thing when creating the wings in that I didn’t use any roundness and kept the lines very clean. The font used for “Honey Bee Hive” is Copperplate Gothic Light. This font works great for short lines of text, whether in a logo or for a headline (which I did use this for the blog headlines). The hard angles in this font and the straight lines looked great when paired with the bee. 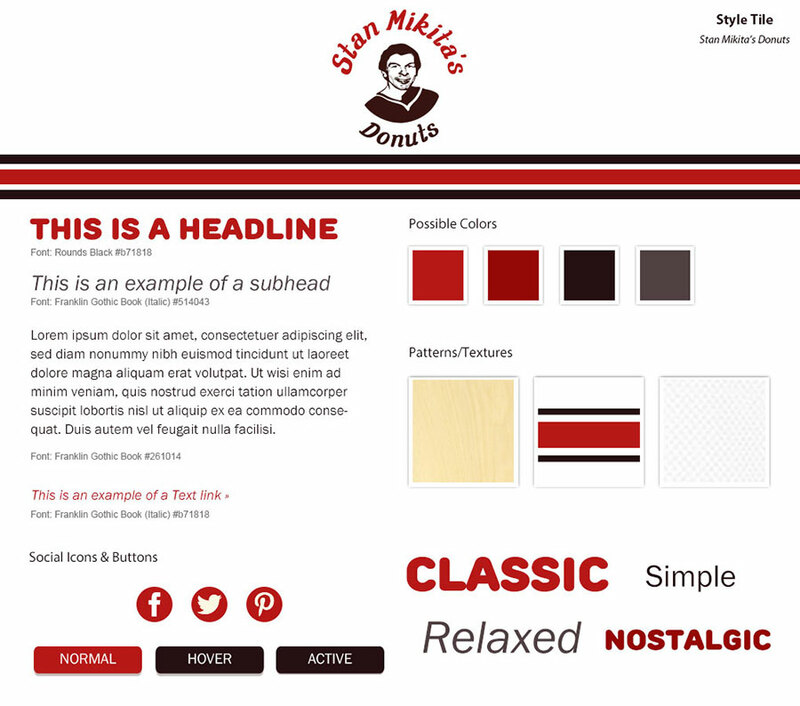 For the tagline “A web design & development blog,” I used Afta Sans. Not only does this font look very modern, but it helped balance out the very harsh angles and lines in the Copperplate Gothic Light, which still maintaining the technical aspect of this site. The first plugin I used was Recent Posts Widget With Thumbnails which I used is the sidebar on each page. This simply allowed me to display a few of the most recent blog posts along with a thumbnail image and the blog post headline. The second one I used was Contact Form 7 which allowed me to create and add a very simple contact form on the Contact page. The third plugin was called Simple Share Buttons Adder. This allowed me to add share buttons, using my own icons, to all of the blog posts. They also wanted business cards, letterhead and an envelope designed that utilized the new logo. The design of these elements was to be kept simple so as to keep printing costs down. 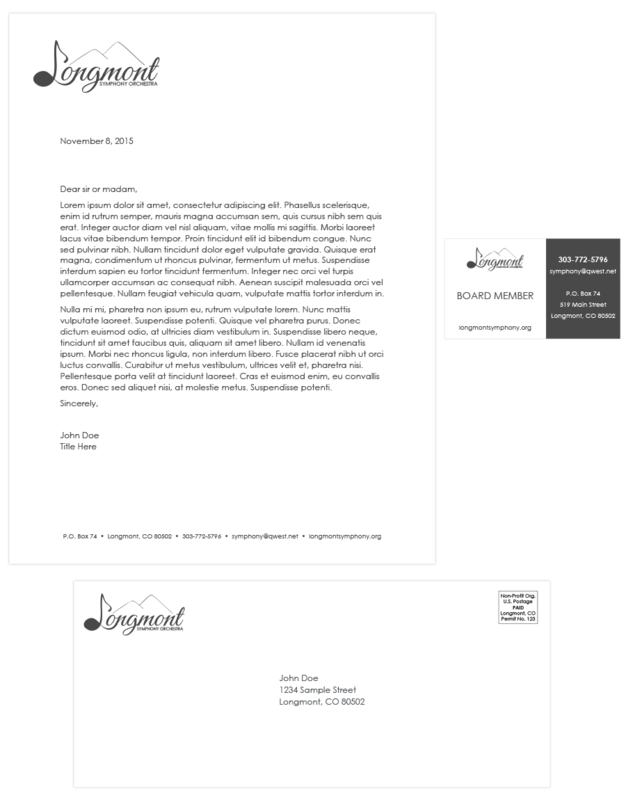 The final logos include one with “Longmont” spelled out in a script font and “Symphony Orchestra” in a simple, plain font below, and another with “LSO” on top and “Longmont Symphony Orchestra” in the simple font below the three letters. In both logos, a simple drawing of the mountains in Longmont was included, which are referred to locally as the Twin Peaks. 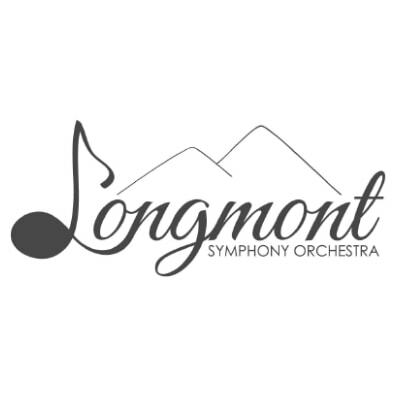 The simple lines of the mountains were meant to reflect the plain lines of the font used for “Symphony Orchestra” in the first logo and “Longmont Symphony Orchestra” in the second logo. In both logos, the “L” was made to look like a music note so as to not only draw one’s attention to the logo, but make sure it is recognized as the logo for the Longmont Symphony Orchestra. The script font helped to soften the straight lines of the mountains and the plain font, and also reflect the flowing nature of music. The branding pieces created include business cards, letterhead and an envelope. All of the pieces were kept very simple to keep printing costs low. Since the business cards were going to be used for the board of directors of the orchestra, it was decided that it would be more cost effective to have all the cards say “Board Member” and have the general contact information included on them instead of having a card made for each board member. For the letterhead they just wanted a very simple design with the logo on the top left and the contact information along the bottom. The same was done with the envelopes by simply placing the logo and return address on the front in the top left corner. 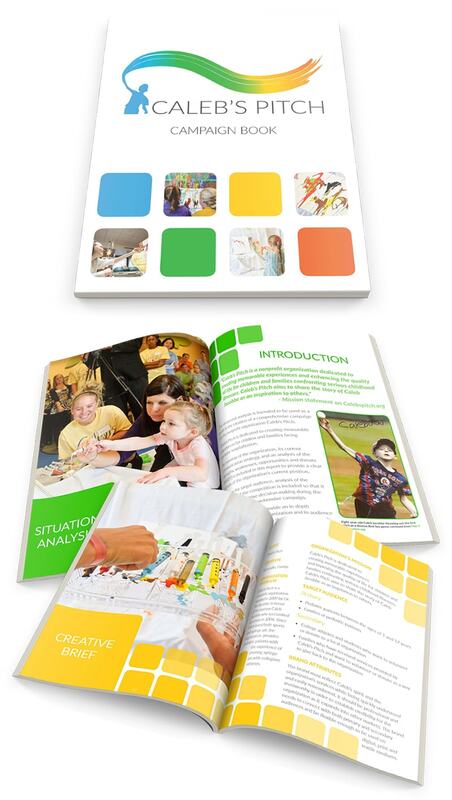 To create a 10-page informational guide with InDesign for any non-profit organization. 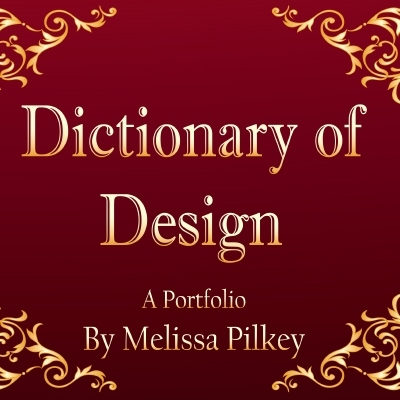 The purpose of the project was to demonstrate my ability to work with typography, visual elements and use a variety of required paragraph, character and object styles. 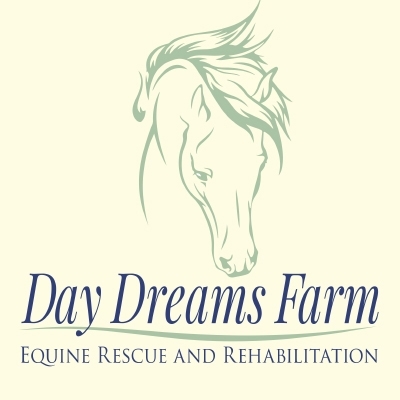 I chose to create a guide for Day Dreams Farm Equine Rescue and Rehabilitation. This is a non-profit that is near wear I live in Michigan, and one I feel does very important work in providing care for helpless animals. Since this organization did not have a standard logo, as they just use their name, I put together a simple logo for them. I want to mention, however, that I did not create the horse head in this logo. As this was a project meant for educational purposes only, I found a horse head design online that I felt would work well for the organization and incorporated it into the overall design, and felt it really captured what they stand for. 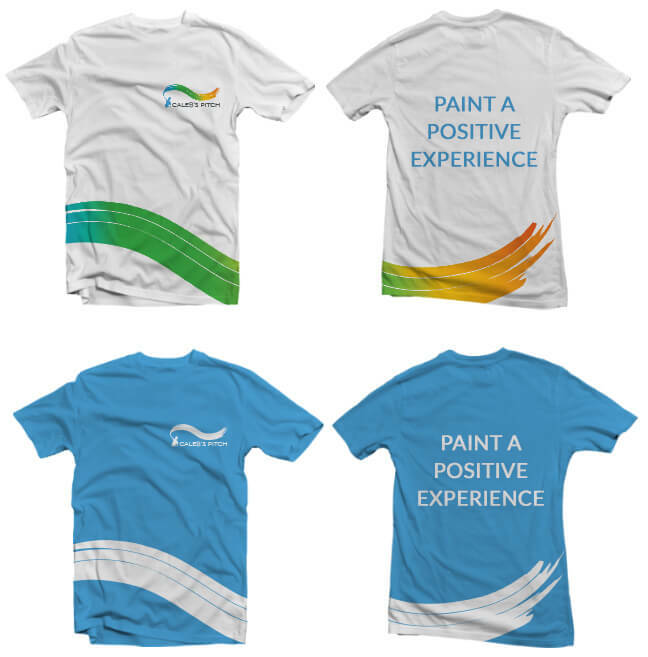 The logo utilizes soft blue and green colors that not only give off an earthy, natural feel, but also are inviting colors that draw one’s attention and make one want to see what the organization is about. These are the colors I chose to use throughout the guide as well. I did choose a third cream color for the background, as I felt that, although the cream is subtle, the stark white did not go with the softness of the logo or the theme of the guide. 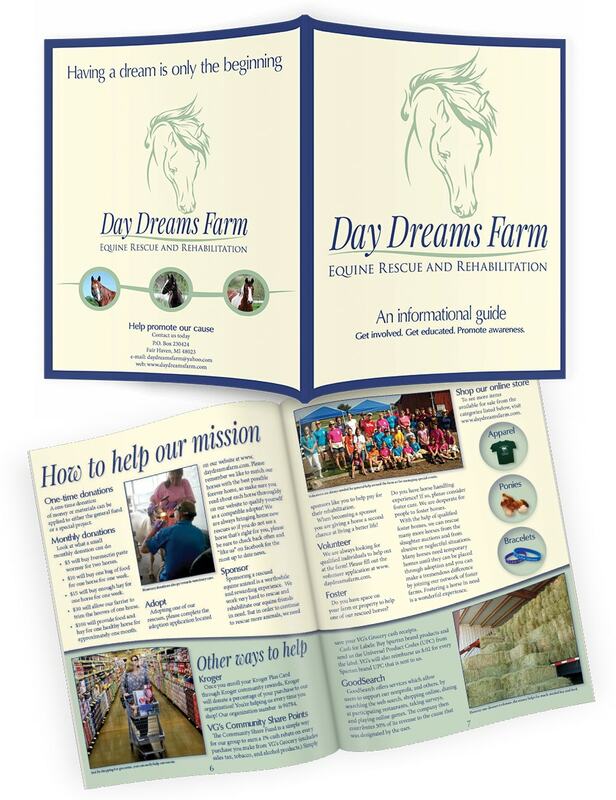 On the cover of the guide, the logo uses Playfair Display (italic) for “Day Dreams Farm” and Trajan Pro (regular) for “Equine Rescue and Rehabilitation.” The headline and subhead font below the logo is Oregon LDO (Book and DemiBold). I felt the Playfair font in the logo had a soft and “flowy” nature to it that mimicked the curves in the horse head, while the Trajan Pro used in the bottom wording of the logo serves as a base or foundation for the logo to sit upon, while still not being overpowering or too strong of a look. For the headline and subhead underneath the logo, I didn’t want to detract from the logo by using one of the same fonts, so I chose Oregon LDO because it is a simple, sans serif that gets the message across, and invites the reader to open the guide and read more. On the inside of the guide, I used the Playfair Display for the headlines to mimic the logo on the cover. For the subheads, I used the Oregon LDO (DemiBold) that is on the cover, which works well to distinguish itself from the serif body copy. For all other copy, including for the letter, letter signature, cutlines, etc. I just used variations of Minion Pro, because I didn’t want to use a lot of different fonts. With the variety of font styles that Minion Pro offers, I felt this font worked well for multiple areas of the guide. On many of the images, I wanted to copy the curvy green line in the logo by giving them a curved edge. I also gave the images with the curved edge a drop shadow, above or below depending on the placement of the image on the page, to make them standout a little so they gave a little visual interest. For several of the pages, I reflected some of the same design elements on these pages such as the blue and green sidebar boxes, the stroke on the small photos, and the curve on the large top image and one of the bottom images that again reflects the curve in the logo. I felt the placement of the images, text and sidebar boxes would allow the reader to easily move from one page to the next; the eye flows from the top of the page, whether it starts on the large photo, or a headline, and moves down the page and then reads, or views, the sidebar information. On the back cover, I placed the headline at the top because it serves as a reminder that we can all do more to help. This leads into the logo, though slightly smaller than the front, the three horse photos, which help to reiterate what the rescue is fighting for, and the contact information on the very bottom so people can begin to help in any way they can. Create a printed portfolio book of some of my work to submit for entrance into a Master of Architecture program at the University of Michigan’s Taubman College. Before earning my Master of Arts in Mass Communication, I applied to the architecture program at the University of Michigan, as I have many areas of interest. After submitting many different things, with this portfolio book being one of them, I was accepted to the very exclusive architecture program. However, the program proved to be too expensive for me to afford, so I chose another educational path in something I also enjoyed: Web design and communication. In the book, I showcased five different areas of creative arts that, at the time, I had done work in: Editorial design, graphic design, needle felting, photography, and photo manipulation. I came up with the idea of creating a dictionary as it brought everything together under one cohesive title and also served as a way to describe various sections of the book. Each section includes a dictionary-style definition for that particular creative art followed by three to five examples of my work. 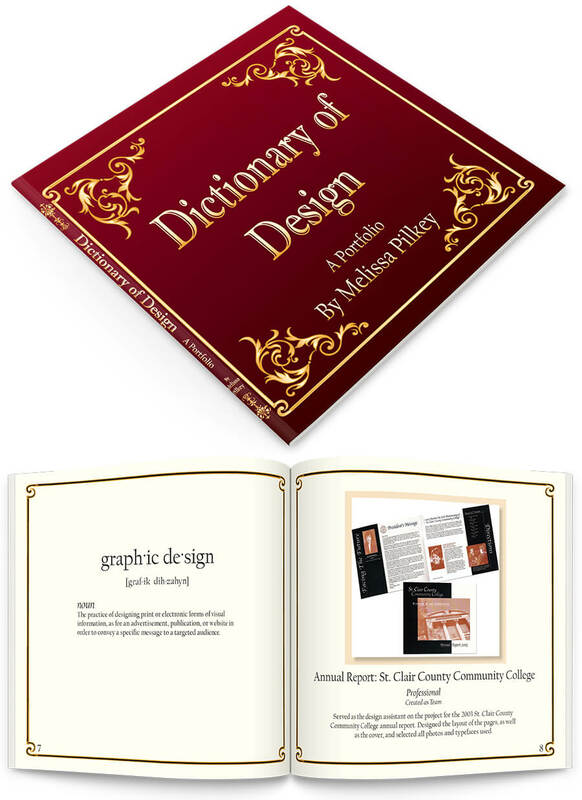 I wanted it to look more like an old-style dictionary, so I used the golden scroll work on the cover and inside cover page, as well as on the borders of each page of the book. 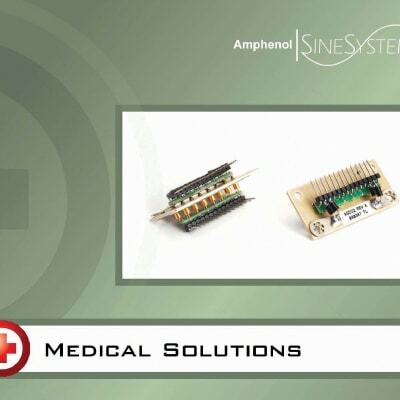 Create two posters that highlight component parts created by Amphenol Sine Systems that are used for medical equipment, and military and aerospace equipment. These posters were to be displayed in one of their main office locations. 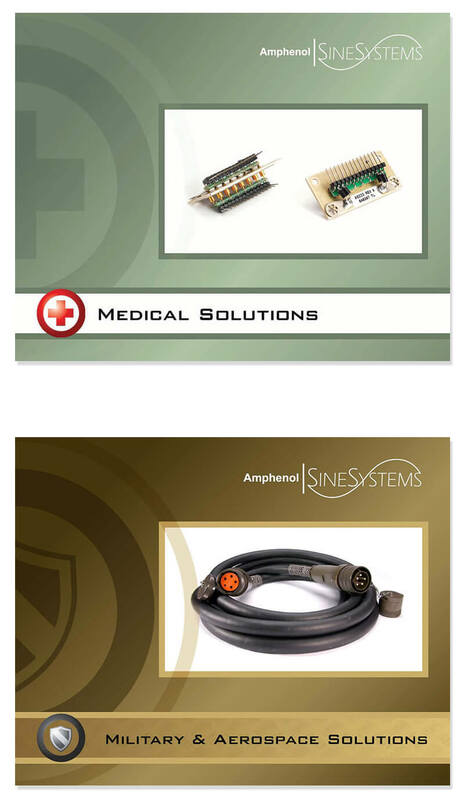 For both of the posters, I utilized colors that were used in other branding materials for the particular category: Medical Solutions or Military and Aerospace Solutions. I also used a symbol in each poster that corresponded to both of these categories respectively, which were also used throughout other branding materials the company had at the time. I made the symbol very large and overlaid it in the background on both posters. I also set these symbols somewhat off-center and made sure that the other part of the symbol was cropped out of the posters. This added an extra bit of visual interest to the gradient color in the background. For each poster, I used a photo of one main component part that is used for each of the categories on a bright white background. This helped draw attention to the products, as they were to be the main focus of these posters. Develop a situation analysis for a publicly traded firm or organization for the semester-long project. Since I have a strong interest in Netflix, as I use it quite often, I chose to do my project on this company. 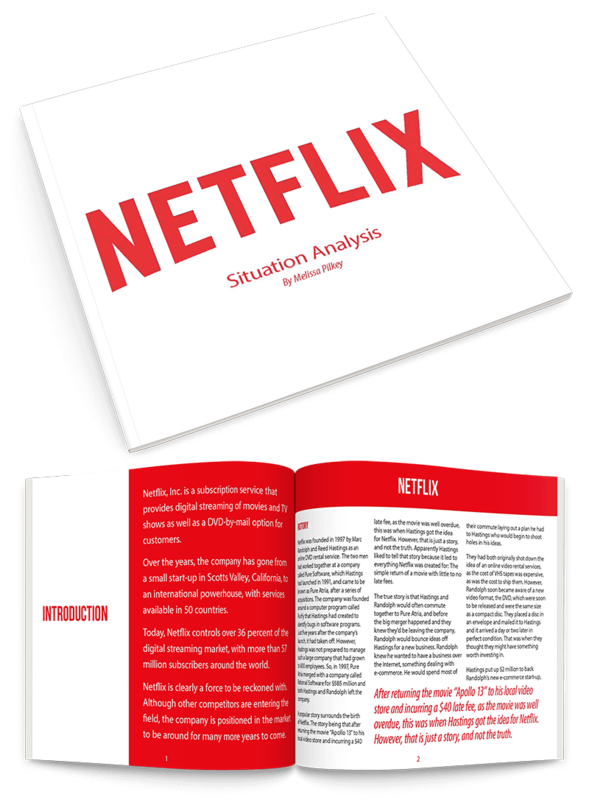 In doing my research on Netflix, I utilized a number of different resources to obtain information. One of those was a book titled, “Netflixed: The Epic Battle for America’s Eyeballs” by Gina Keating. I have to say, this was a really great book, and if you like Netflix, this is a good read. I rented it from my local library and had it completely read in a few days. For this project I was tasked with finding information on the company’s history, growth, reputation, information on the service itself, how the company distributes its services, sales and profit history, marketing, target markets, its share of the market, a SWOT analysis, the industry as a whole and the company’s competition. After completing my research and writing the analysis, I had a much better understanding of this company, and I appreciated their service more, as I know where they started from and what it takes to stay where they are to keep providing such a great service. 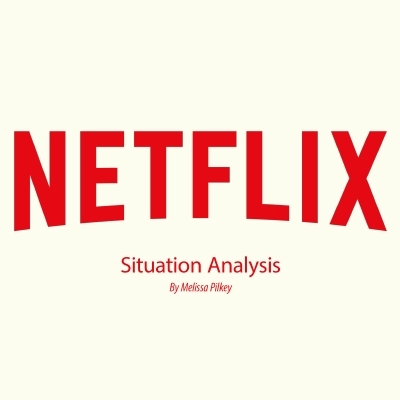 Since Netflix typically uses only red, black and white in all of its branding, that is all I chose to use for the design of this situation analysis. A simple white background for the majority of the pages with black body copy and red headlines in the copy. For the headers on each page, I used a pop of the red color for the background and white text to show what each section was about. I also used pops of red text for pull quotes on some pages to make them stand out from the rest of the text on the pages. The overall effect was a document that was simple and clean, but highlighted information in all the right places. For this project, I was to identify a cultural artifact (an image or some type of symbol in society) that reflected something I was interested in. I then had to identify its meaning and representation in society, explain why it was a relevant example of symbolism in our culture, and apply any relevant media theories or perspectives that I found to be represented by this artifact. 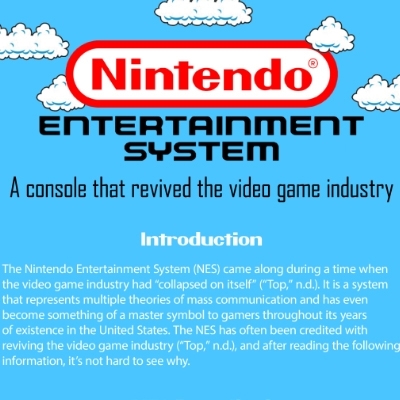 Due to my interest in video games now and while I was growing up, I chose the original Nintendo Entertainment System (NES) as my cultural artifact to analyze. In researching this artifact, I found information on its history, the market it was in, how it was represented and its intended uses. 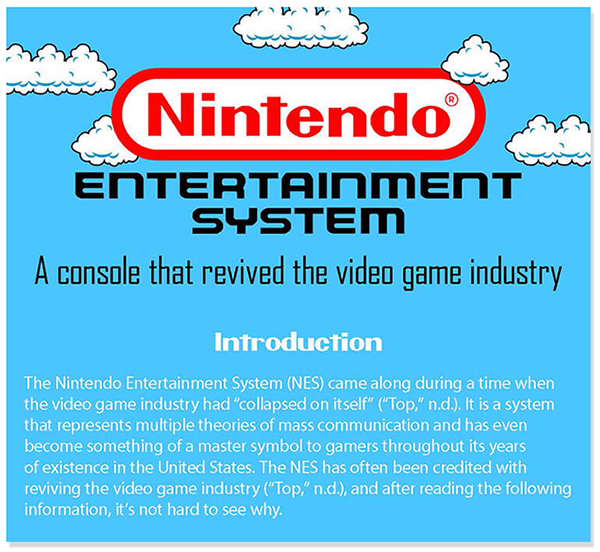 Since this was a digital communications theory course, I then had to identify and apply any media and communications theories that I felt the NES represented. I was also tasked with providing a critical analysis of the NES which was to include when I first encountered this artifact, how it is socially positioned, the purpose it serves, whose interests it serves, and if there were any alternative ways to present or distribute this artifact. At the top of the document, I use the clouds that surround the Nintendo name with the sky blue background. When you scroll all the way to the bottom, I placed the graphics and characters from the “Duck Hunt” game in the grass here and placed my references for this project in the grassy green area. I think the overall design of this project is very fun and invites one to read it to see what it is all about. Maintain a seven-day diary of my interaction with all media in my life. Identify the number of connection points I have and think about the reasons I use them; what role(s) do they play in my life? Submit any type of media file that I think adequately represents my experience with developing the diary. I then had to submit a written analysis of my media usage, focusing on any applicable media and communication theories to my understanding of my involvement with media and their influence on me, my environment, and others in it. 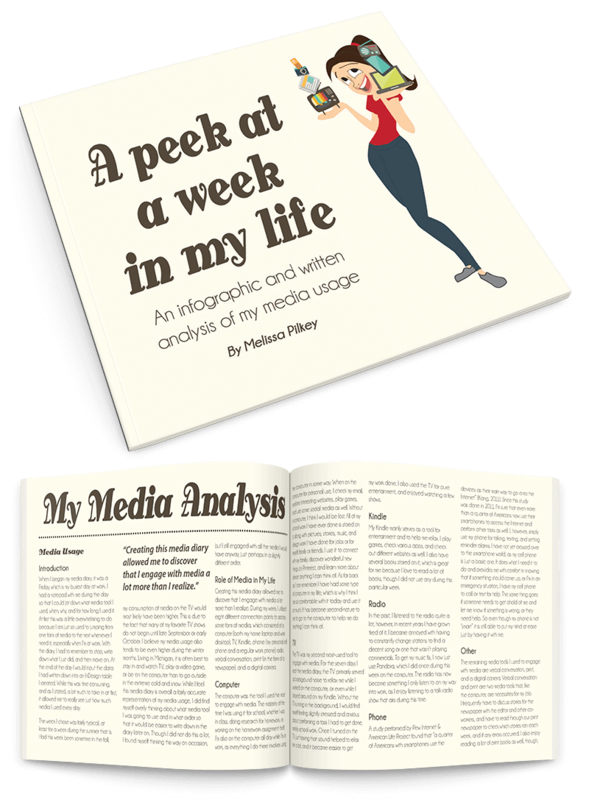 Although it wasn’t easy to write down every time I used, or spoke about, some form of media, which for me included a computer, digital camera, Kindle Fire, Phone (non-smartphone at that time), print, radio, TV and verbal, it turned out to be a fun project. 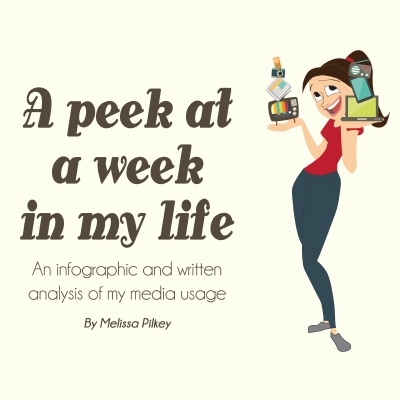 After completing my seven-day diary, I decided to create an infographic that showed how I used various media throughout the week. I used Illustrator to lay this out and used various colors, and font sizes and weights to add emphasis and interest. I also used several different free graphics I found online and tweaked a bit for my needs in the infographic itself. For the graphic of the girl holding the various media tools and the one of the girl sitting at the table with a computer, I found two pencil drawings someone had done online and I used the outline to draw over these illustrations in Illustrator, since this project was simply intended for educational purposes only. I changed the clothes, the hair, and tweaked the face a bit and also added the colors. For the overall design of the media analysis and infographic, I wanted to go with a classic look, something that had an old-school feel from the ‘80s, since I am a child of that generation. For the headlines, I used a font called AntsyPants. When paired with the brown color and the cream background, this just screamed classic ‘80s to me. For the rest of the text on the infographic and in the written analysis, I used Champagne and Limousines. Although this font is slightly more modern looking, it is still a simple, elegant font that I felt paired nicely with the AntsyPants font. After creating the infographic, it was easier to examine my media usage for the written analysis portion of this project. I had to discuss the overall role media had in my life, and then explain what purpose each piece of media I used serves in my life as well. After this, I had to apply various media and communication theories to my usage of media. 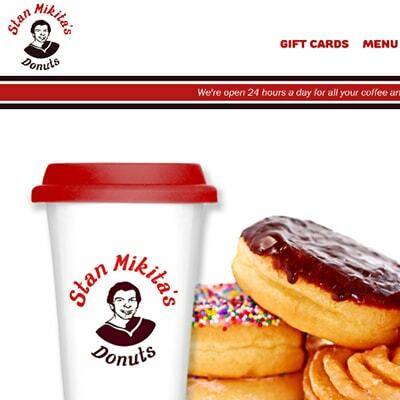 The restaurant I chose was Stan Mikita’s Donuts from the movie “Wayne’s World.” This was a fun project and one of the first responsive websites I created. In doing some “research” by watching the “Wayne’s World” movie, I came up with the red, white and brown colors for the website. Since the Chicago Blackhawks play a prominent role for the restaurant, as Stan Mikita played for the team and the restaurant was supposed to be located in Illinois, the red and white colors come from the colors for the Blackhawks. Although the team’s colors are red, white and black, I chose to go with a brown color instead of black because it resembles the color of coffee and chocolate donuts. The stripes used on the website, and on the gift card, were meant to resemble the stripes on the Blackhawks jersey. I also used the light wood texture that resembles that of a hockey stick. I chose to go with a one-page layout for this website. Since there wasn’t a lot of complex content for this site, the one-page scrolling format works well. It is simple but displays all the information needed on any size screen. I used four different jQuery plugins on this website. SlickNav is a responsive navigation plugin which I used for the mobile-style navigation on smaller screens, and I used ScrollFix on the header which made that element fixed when one scrolls through the website. For the popup boxes on the menu items and for the gift card varieties, I utilized the portBox plugin, which was a very easy to use jQuery modal. To get the smooth scrolling effect between various sections on the site, I used the Smooth Scroll plugin. Create a WordPress site for a client (fictional or real). The website was to include the usage of plugins, well-manicured content, was to be fully responsive, and include a home page, five internal pages and a blog as well. 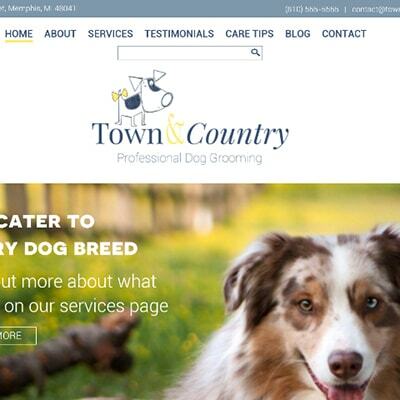 I chose to do a website for a fictional dog grooming business, Town & Country Professional Dog Grooming. Since I went with the name, Town & Country, I wanted to go with softer colors which would give off a clean, yet country feel as well, so I went with blue and yellow. Although I did put the logo together, I did not create the dog graphic. It was part of a textile design that I found on Pinterest, which I cut out and used for this logo. On the Home, About Us and single blog post pages, I wanted to use nice full-width images that would really catch one’s eye on the site and give a very classy, professional and clean look. I didn’t want there to be any edges on this site, so I also used full-width background colors on many of the various sections throughout the site, with the rest of the sections just being a simple white background to keep with the clean feel. Although the use of the grid feature from Zurb’s Foundation was not a requirement for this project, I chose to use it. 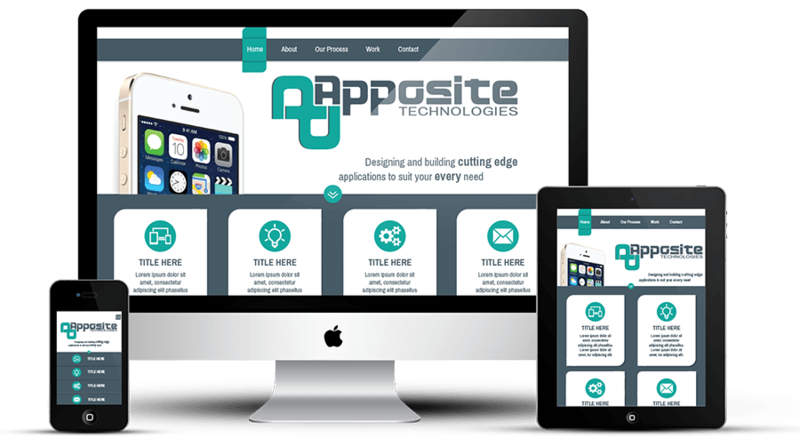 It is very simple to use and aids in creating the responsiveness throughout the site. I created the social media icons in Illustrator by using a dog paw print and small dashes to outline the paw. This created a stitched effect which goes well with the stitched country dog in the logo. I also used these stitched paw prints as bullet points on the About Us page, for the blog info on each blog post, and for the social media share icons on the individual blog post pages. I used three different WordPress plugins for this site. The first was Recent Posts Widget Extended which I used on the Home page. This allowed me to display a few of the most recent blog posts along with a thumbnail image, the blog post headline, a short excerpt and a button to go to the blog post. The second one I used was Contact Form 7 which allowed me to create and add a very simple contact form on the Contact page. The third plugin was called Simple Share Buttons Adder. This allowed me to add share buttons, using my own icons, to all of the blog posts. 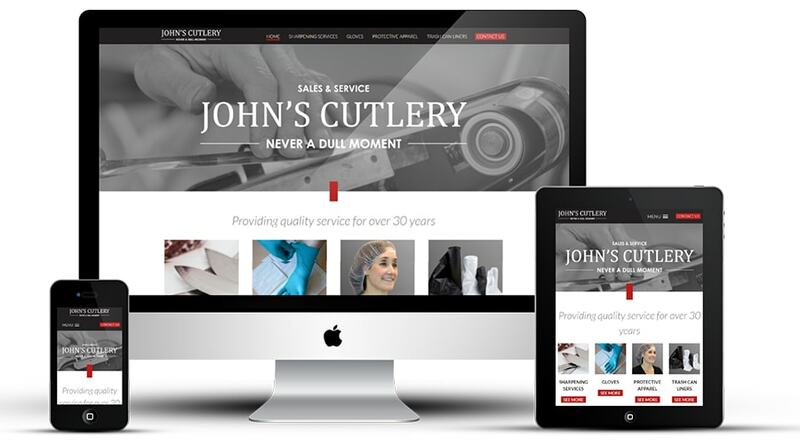 The client wanted a website for their sharpening service business (John’s Cutlery), as they didn’t currently have one. They mainly wanted the website so potential, and current, customers would have something to link to from digital advertisements they continually run for their business. The client wanted the overall look to be clean and professional, and be simple and easy for visitors to navigate. The client also preferred that a WordPress site be created so that they could do some updates to the content of the website themselves if need be. 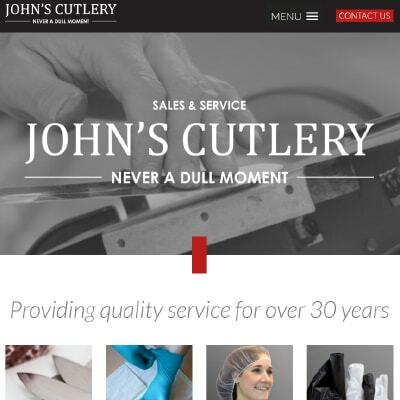 I created a fully customized design and coded the website to be used with WordPress for John’s Cutlery. The website contains five pages, including the home page, for the client's sharpening services, and items they offer their customers such as gloves, protective apparel and trash can liners. It was important to the client that a “Contact Us” button be very visible on every page, as their main call to action for the website is to get people to call or email them. The bright red “Contact Us” button is placed in the header on every page, whether on a desktop, tablet, or mobile device. There are also other instances of calls to action on a few of the pages for the customer to “Call Us” or “Email” etc. Each of these instances are made larger on the page in bright red and link to the contact information when clicked.